When your kid is the proud owner of a new iPad or you are trying to protect their current one before it suffers a cracked screen or even worse, it will no longer turn on, it is time to buy a great case for it. The current technology for cases for iPads and other electronic devices has come a long way in the last five years. With kids using iPads for learning and leisure, it is very important to protect your investment while still having full access to the ports and charging it still easy to complete. They have cases for all types of uses, compatible with the different iPad generations. Particularly when it is the iPad your kid uses, you want to make sure the case fits and that it is the strongest and most-reliable. iPads are great tools for kids but they're expensive and can be quickly destroyed in little hands if you aren't careful. Our latest upgrade lays out all the facts of each product to help you shop for the best protective case for your child's tech! We recently updated this page to make sure that all products are still available and that all information on the page is up-to-date and accurate. We hope that our list of the best IPad cases for kids in 2018 will be helpful in making the best choice for your loved ones. When your child wants to use their iPad hands-free, they can simply fold the legs out from the back of the case. The legs give the iPad the ability to stand freely on its own. The built-in handle can easily be grasped by tiny hands and makes transporting this iPad a breeze. The case is designed with cutouts and openings, so your child still has full access to the iPad’s buttons. The Ledniceker kid’s case is designed for the iPad 2, 3, and four. 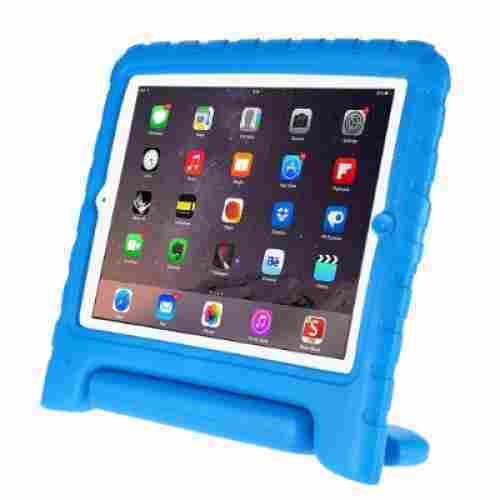 This thick foam case fully encases your child’s iPad and even raises above the surface. 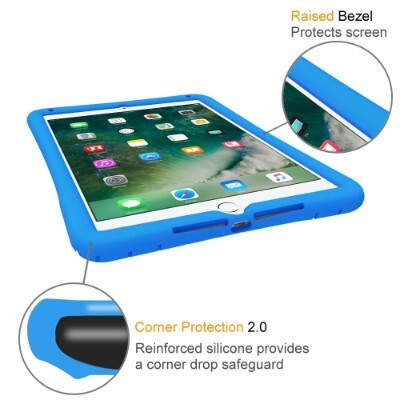 With the case rising above the surface, the screen will be safe if your child accidentally drops the iPad or lays it face down. Composed of EVA foam, this case is able to withstand countless adventures with your child. The built-in handle is a nice touch as it makes it easier for your child to carry their iPad from place to place. The legs allow the iPad to stand freely on its own so your child can enjoy using it hands-free. When the legs are not being used they easily fold into the back of the iPad. While this case is highly durable it is still lightweight enough that your child will be able to carry their iPad with ease. When purchasing you can choose between eight different colors to find one that will fit your child’s taste and style. 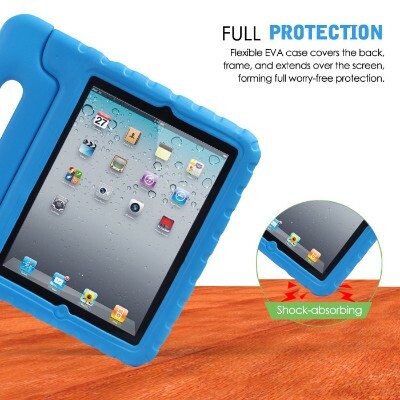 If you have a child who’s very active that he or she drops almost anything and everything he or she can get his or her hands in, then the HDE Shock Proof iPad Case for Kids is perfect. Designed for kids (and adults) with butterfingers, the HDE will keep your kid’s tablet regardless of how many flights of stairs it drops on. The shockproof case of the HDE has been considered top of its class as can be attested by more than 1,500 customers who have left invaluable feedbacks about the HDE on Amazon. The EVA foam that forms the protective shield of the HDE creates a superb shell around your Apple tablet without adding unnecessary and often cumbersome weight which your child will find annoying. This gives the HDE a super thin profile so it can still easily fit inside your child’s school bag. 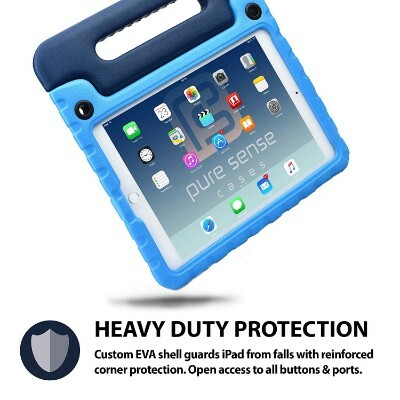 When looking for an iPad case for kids it would be hard to find one that gives as much protection as the HDE. This case is designed to withstand any wear and tear a child can put it through. It is also designed to protect viable areas of the iPad from a computer's worse enemy liquid. 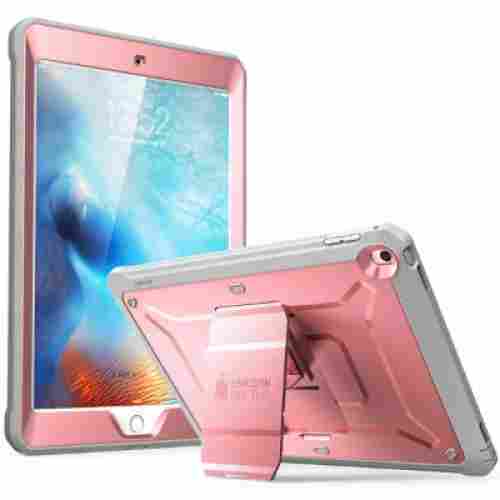 The HDE will also provide excellent shock proof protection when an unforeseen accident, which makes it the ideal iPad case for any child. 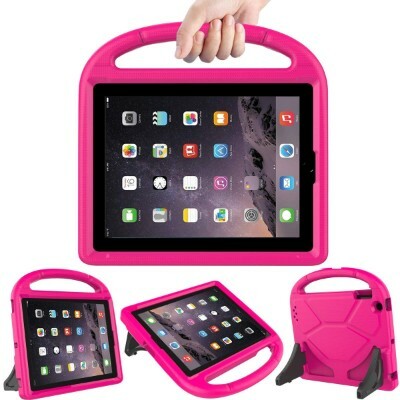 With a variety of color styles to choose from, the HDE is one excellent shield for your kid’s iPad 2, 3, or 4. The accessibility of all the ports is phenomenal while the inclusion of an integrated handle-stand is quite simply, amazing. Aside from its superior shock proofing technology, the HDE also come with an amazing spill resistance. Unfortunately, it will never protect your child’s tablet should he or she decide to take it for a swim. The cutouts on the HDE have also been meticulously thought out so that it won’t interfere with your kid’s optimum enjoyment of his or her iPad. Volume controls as well as the camera are easily accessible. The charging port is secured by a pop-out so you can be certain the sensitive contact points in the charging mechanism stay intact and free from any dirt, dust, or debris. When it’s time to charge your kid’s iPad, just pop out the enclosure and start charging. And here’s one thing you’ll love about the HDE. Its integrated handle can actually be rotated a full 180 degrees to serve as its stand. 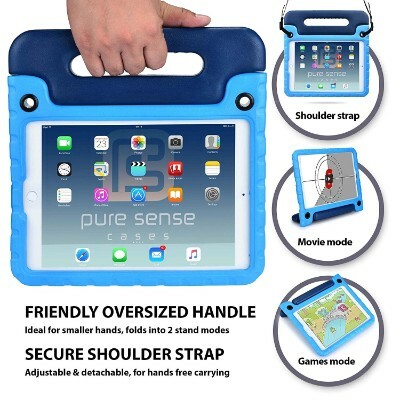 The size of the handle allows for a more stable stand giving your child superb viewing without having to worry about the iPad getting damaged because of accidental bumps. Screen protector can develop small air bubbles. The Apple iPad Pro 9.7 Pure Sense Buddy was designed not only to protect the iPad but a child as well. This revolutionary iPad case actually includes anti-bacterial properties within its EVA foam to help guard a child from germs around them. This can give a parent not only piece of mind that the iPad is protected but also their child regardless of who the iPad comes in contact with. This makes the Pure Buddy the first ever iPad case to guard against all forms of bacteria while keeping the iPad protected as well. Now, the Pure Sense Buddy is not only great because of its antimicrobial technology. It also has a very sturdy casing giving the tablet armor-like protection but with the weight of a feather. The rubberized EVA foam cushion helps ensure optimum resistance against shocks and drops. It also has a raised bezel to make sure the screen of your child’s iPad will never get scratched or broken. Just for good measure, Pure Sense Buddy also comes with a screen protector so that the sensitive hardware of these devices stay intact and in pristine condition. Custom cutouts retain the full functionality of your child’s iPad. One of the downsides to sharing things with others, including devices, is that we’re never really sure if it is still clean when it’s returned to us. While we don’t have a severe case of obsessive compulsive disorder or OCD, there are quite a number of us who are particularly concerned about possible cross-contamination. With an ever increasing number of never-before-heard diseases, it does pay to be a little cautious. 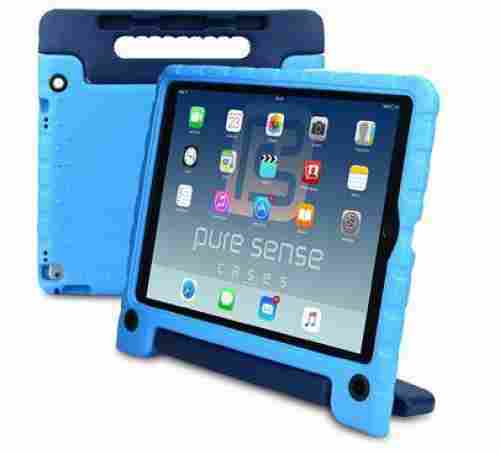 If you want to protect not only your kid’s iPad but also his or her health, then we suggest getting the Pure Sense Buddy Case for iPad Mini 1 to 4, iPad Air 1 and 2, and iPad Pro 9.7 and 12.9. Why? This case is the first of its kind to integrate the SteriTouch Antimicrobial Technology which effectively controls the growth and proliferation of microorganisms that are deemed responsible for the foul odors and stains that are often found in such devices after some time. Silver ions help to neutralize bacteria and other microorganisms which may be present on the surface of the Pure Sense Buddy. At any rate, this should help keep your child’s tablet relatively clean. The antimicrobial technology embedded into the Pure Sense Buddy is one of the best things about the product. The good thing is that the substance used is fully approved by the FDA and has a long-lasting antimicrobial property of 10 years. Your child will also love the integrated handle as it can be folded upright to serve as a stand. And get this. The Pure Sense Buddy comes with a beautiful strap that attaches to both ends of the Buddy and turn your kid’s iPad into a digital messenger bag, a sling, a cross body holster, or even a shoulder bag. With all these features, don’t be surprised to find this in this list. There is not a cut out for the power button. If you’re a proud owner of the new iPad 9.7, then the Fintie iPad case is perfect for you. 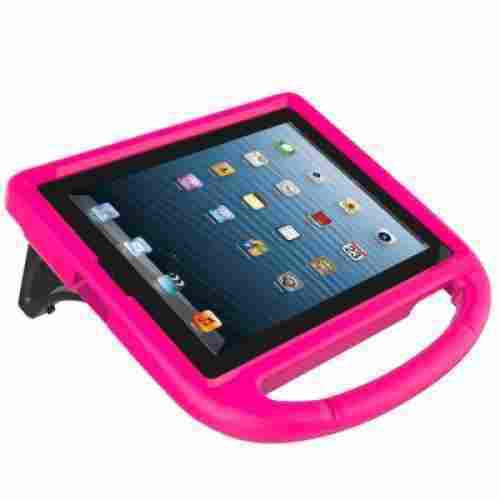 While the case does fully cover your child’s iPad, it will not hinder their ability to use it. It is designed with cutouts that make the buttons easily accessible. 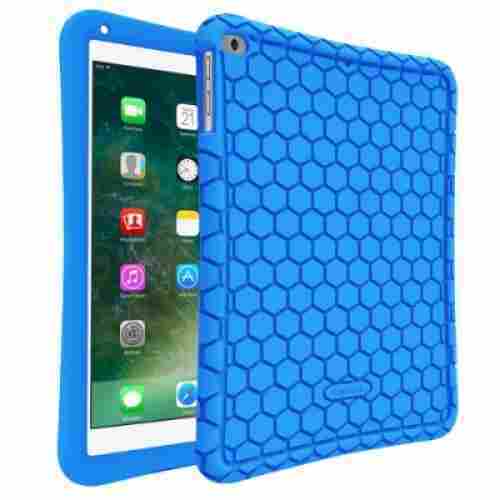 This honeycomb case is available in eight bright colors. If you’re a proud owner of the new iPad 9.7, then the Fintie iPad case is perfect for you. This case is composed of silicone that is durable and impact-resistant. 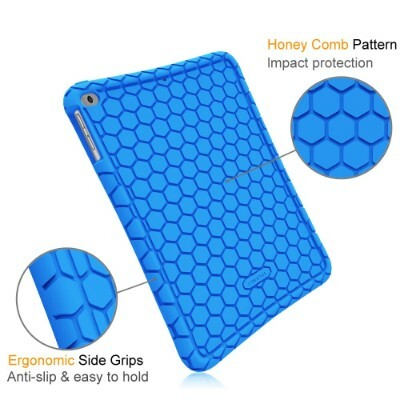 The backing of the case has a honeycomb design that increases the level of protection against impacts. The silicone material is easy to hold and provides an anti-slip grip. The raised edges of the case will protect the screen from scratches if laid face down. It will also protect the screen from cracks if it lands on its face when accidentally dropped. If you’re worried about germs collecting, the silicone material can easily be wiped clean. This case is easy to put on and take off. The honeycomb pattern is a unique and practical feature of this case. Not only does it look cool, but it also increases the level of protection and provide an anti-slip grip. The built-in kickstand allows the iPad to stand up. The Unicorn Beetle Pro iPad case by Supcase is sure to keep your child’s iPad protected. 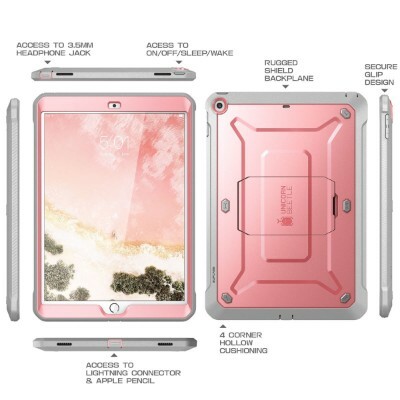 Designed for the iPad 9.7, the dual layer design provides protection to both the inside and outside of your child’s device. 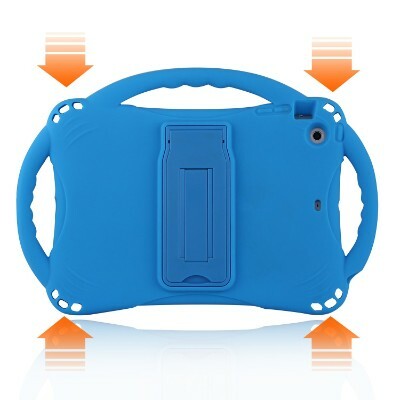 The inside of the case is equipped with a TPU lining and the outside is composed of a polycarbonate outer shell, both of which provide protection when the iPad is accidentally dropped. 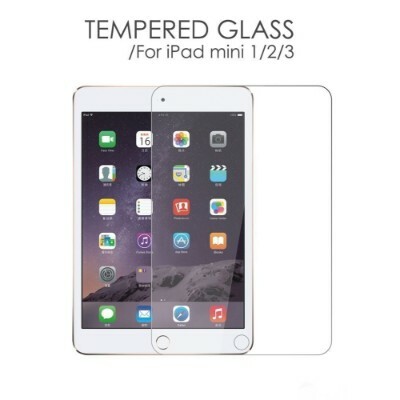 The built-in screen protector will leave your child’s iPad screen free of cracks. 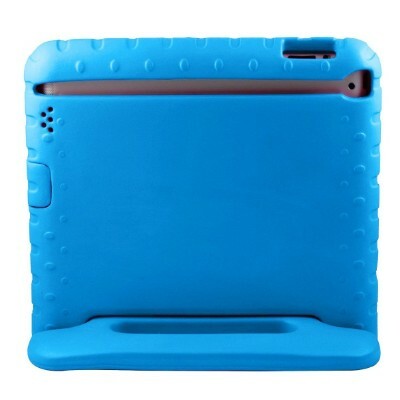 The back of the case has a built-in kickstand which will allow your child to use their iPad comfortably when lying down. The case provides a secure and tight fit around the iPad, which eliminates the possibility of it slipping out and breaking. While the plastic screen cover provides full protection to the device’s screen, it will not interfere with the touchscreen function. Your child can still easily operate the iPad with the screen protector and case. The combination of the port covers, screen protector, and the dual-layer design provide the iPad with full protection so your child is free to take it on any of their adventures. The case is also equipped with port covers so your child can their iPad anywhere without having to worry about sand, dust, or debris entering the outlets. When purchasing you can choose between seven different colors and designs to fit your child’s taste. Carrying a tablet for a toddler can be a challenge. This iPad case solves all the problems of allowing your toddler to carry around their tablet. It features a built-in carrying handle, and a system that protects it from drops and environmental harshness. The protective case is constructed of premium materials that have been created from silicone. With iPads and other tablets becoming so popular with even the youngest kids, it is important to make sure that you are able to protect your investment with a case that is going to stand up to the harsh conditions that a kid can put it through. This case has proven itself time and time again. Plus the built-in pop-out stand is great for when they are watching a video. Often when putting a case on an electric device, it seems that you lose some functionality of the buttons or ports. This iPad case has been designed and molded to allow full access to all the buttons, ports, and charging port. The precise cutouts allow users to still enjoy all the features of the iPad while making sure that it is protected. The silicone case has been molded in the exact shape of the iPad and has all the cutouts that perfectly fit so the charging ports, speakers, earphone port, volume, and power buttons are still easily accessed and fully functional. Each of the corners on the case has a cushion giving it the ultimate protection against falls. It keeps the dust out, keeps the screen from scratching, and has been created just for kids. 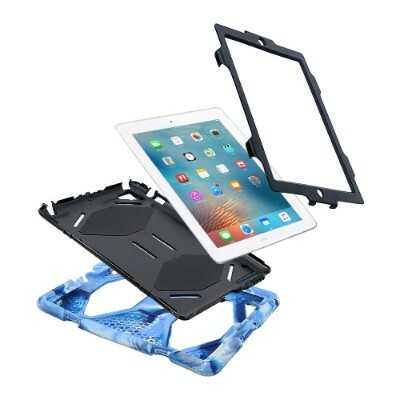 This iPad case and flip-out stand will protect and preserve the iPad from the extreme conditions of a kid. It comes in four different colors. 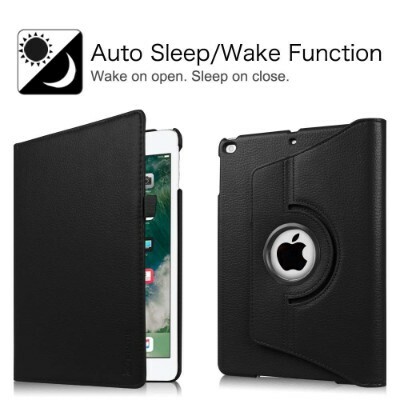 The dual-layer design of this iPad case offers full advanced protection against bumps, drops, and shocks. With full access to all the buttons, the camera, and all the ports, the case protects without being an issue when it comes to charging. All the ports are sealed with a silicone flap that fully closes to seal. This protects the entire iPad from the elements. Dual-layering protection cases for iPads are a combination of both soft sleeves and hard cases. When placed together, the protection can stand up to all the bumps, drops, and shocking stops that kids are able to put the iPad through. It will withstand those drops that make you cringe when you see happen. 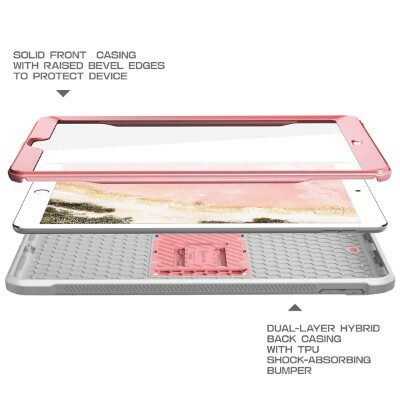 The dual-layer design is a hard-shelled case and flexible sleeve on the inside that when combined together is one of the best protection systems the iPad can have. It even has a grip that rotates 180 degrees plus then turns into a stand for watching videos and playing games. The brightly colored case not only makes it easy to spot the iPad but also offers a complete system that protects and secures from all the things that can happen when in the care of the kids. The bright colors of this case is great for kids. It helps be able to spot the iPad and also to keep track of it on regular bases. The price point for the dual-layer protection is great. The Fintie iPad Case provides a sleek look to your child’s iPad. The case fits snuggly onto the back of the iPad and opens like a book. When your child closes the case, the iPad automatically goes into sleep mode and wakes when the case is opened again. The auto sleep/wake function will provide a longer lasting battery. 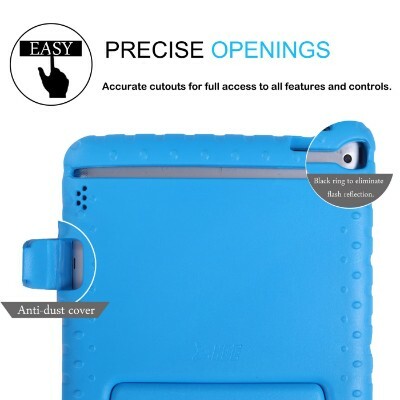 The hard shell of the case will protect the iPad and the scratch-resistant lining will keep it free from scratches. Equipped with elastic bands the case will remain tightly closed until your child is ready to use it. The automatic sleep and wake function allows the fun to last longer. The slim design of the case offers protection to the iPad without causing it to be in a bulky case. 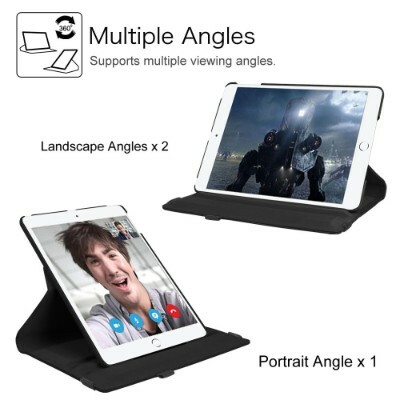 The case converts into a stand and allows your child to use their iPad in landscape or portrait mode. This case is designed specifically for the iPad 9.7 and is available in 15 different colors and designs. The included lanyard allows the iPad to be hung from places. The glass screen protector may break easily. Thanks to the precise cut-outs on the case, your child will still have full access to the ports, camera, speakers, and buttons on the device. The raised lips of the case keep the screen from touching surfaces even when it is placed face down. Along with the case, you will also receive a glass screen protector and a lanyard. If your child has an iPad mini, mini2, or mini 3 you should spend some time thinking about purchasing the TopEs case. 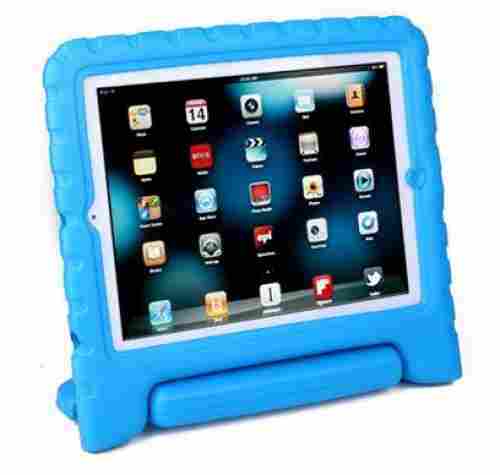 The case is composed of silicone, which protects the iPad and provides a non-slip grip for your child’s hands. The material is non-toxic, so your child is safe to use the case as often as they want. Equipped with three carrying handles, your child can easily tote their iPad around. 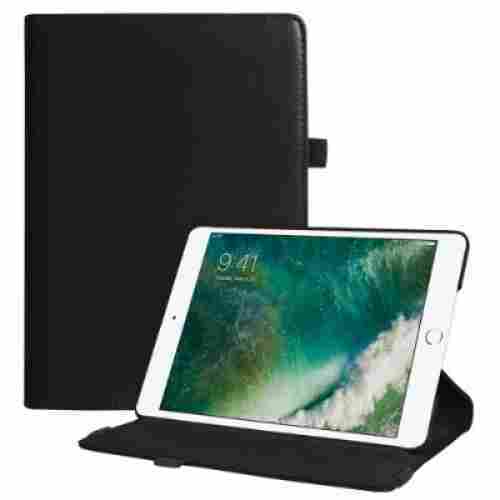 The corners of the case are designed with air cushion technology for added protection when the iPad is accidentally dropped. The built-in kickstand makes it easy for your child to use the iPad while relaxing in any position. When not in use, the stand can easily be folded into the back of the case. Including a lanyard with this case was a unique and genius idea. Your child can strap it to a seat, wear it around their neck, or hang it practically anywhere to be able to use their iPad comfortably. The lanyard can be worn around your child’s neck or strap it around one of the front seats so your child can watch their iPad while sitting in the back of the car. This case is available in blue, green, pink or purple. Let’s be clear about the AVAWO Apple iPad Kids Case. It is only intended for iPad 2, iPad 3, and iPad 4. So, if you have an iPad Air or even an iPad Mini, don’t expect the AVAWO to accommodate your device because it simply won’t. This should be made clear right from the very start to avoid any misgivings later on. That said, the AVAWO is a fashionable shield for certain models of iPads. Made of non-toxic and premium grade EVA foam, the AVAWO comes with ridges all over the sides to give your child superb grip. This helps minimize accidental drops. And even in cases where your child suffers from temporary butterfinger phenomenon, its foam casing helps protect the very sensitive digital infrastructure inside the Apple device. 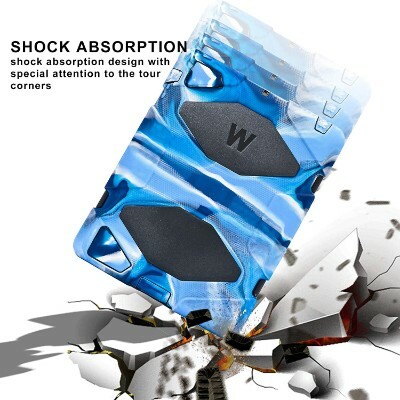 It has an additional layer of anti-slip silicone to further enhance its anti-slip and shockproof properties. In case the rugged surface will fail, your kid’s device will still be protected from the impact. 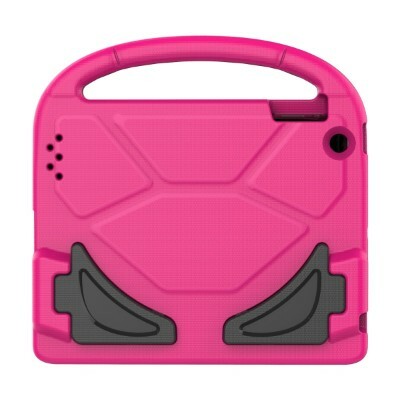 The AVAWO Apple iPad kids case certainly took into consideration that kids tend to drop things. This iPad case was designed to try to prevent an unforeseen accident before it happens. 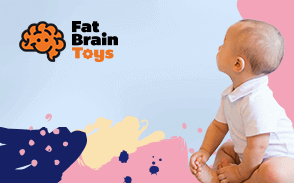 There are components such as anti slip silicone layer and a sturdy rotatable handle to help a child be able to hold onto the device. In those times when an accident does happen the case is designed to withstand the shock and protect the precious unit within. The convertible handle is this iPad’s most notable feature. Your child can use the handle to easily carry the iPad from place to place or they can fold it back and use it as a stand. The AVAWO is quite fashionable, too, as it’s available in 7 colors that are sure to fit the personality of your little one. The thick 180-degree rotating handle allows the AVAWO to be transformed into a tablet stand, propping it at an angle to give children the kind of viewing experience they require. Children can have a more fun way to really make the most out of their iPad experiences. Durability and safety are essential components to an iPad case for kids. The case needs to be able to provide the needed protection to take care of the iPad. This includes being able to absorb shocks from being dropped, and also be able to protect certain vital elements of the Apple iPad from liquid that may be accidentally be spilled on the device. Also, the freestanding feature included in most kids’ iPad cases gives the iPad a bit more security since it can be placed in one spot to stand on its own. Another component taken into consideration was protecting the child; these cases are all free of any toxic material. Yes, we all want an iPad case to protect our tablets but we also want them not to interfere with our iPads functioning properly. 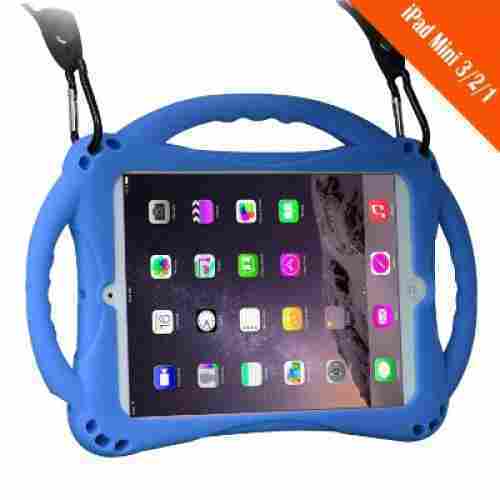 For kids it is of vital importance that they understand that the iPad must remain within the protective covering of the case but to facilitate that, the iPad still needs to work as it would without a case. This is something that manufacturers take into consideration when creating an iPad case. There is a valid reason why the iPad cases for kids come in bright vibrant colors and unique designs. It makes them visibly appealing to kids. Also, if they love things such as robots or butterflies, cases shaped like these are sure to be a hit with a kid. We can help kids to use gadgets wisely and at the same time initiate ways to protect electronic gadgets by making them more child-proof. First, we must be able to set the rules that will help our kids understand what can and cannot be done when using a gadget. For instance, we can enforce a no-eating-while-playing rule to minimize spills, smudges, and other potential damage to the screen and other sensitive parts of the device. These ground rules must be understood very well by children so they know the possible consequences if these rules are broken. For example, drinking while playing may spill liquid onto the device which can damage it permanently. Having a specific place for storing the gadget when not in use can also help. This teaches kids to be more responsible for the upkeep of their tech gadgets. When buying your child an iPad or even when letting them borrow yours, it is important for them to know that this is a powerful yet fragile electronic device that must properly be cared for. By providing a child with an iPad case is one of the first and best indicators of the fragile nature of the device. Your child will learn that the iPad needs to be properly turned off and placed in an area of their room where it can be displayed in the case. First, the protective capabilities of the cases were evaluated. From scratch-proofing to shock-absorption and other features, these cases were carefully assessed as to how they would really keep children’s iPads safe and secure. Second, the fun design was considered. Colors, textures, and other cool features were assessed and determined whether these would be loved by kids. Children don’t need the stainless steel or platinum-plated covers of adult iPad cases. What they need are designs that speak of fun, of being a child. q: Is it necessary to buy an iPad case for a child’s iPad? In a word, yes it is. In fact, it’s even a good idea for an adult to buy an iPad case when they purchase an iPad for themselves. The Apple iPad is an electronic device and is similar to that of the desktop computer and laptop, only it’s mobile. This could lead to more accidents or mishaps with the iPad if it’s not properly cared for. A nice case that can help give the iPad some extra protection is an essential accessory. If we are willing to invest in this piece of technology, then we should certainly invest in properly caring for it so that it will last longer. This is certainly important with kids, as some may still be a bit too young to understand just how essential caring for the iPad is, and the proper case will help ease a parent’s mind about whether or not the iPad will be safe. q: How young is too young for an iPad? It seems that these days kids want newer technological devices quite young. Even toddlers seem to be fascinated by their parent’s computers and mobile devices. After all, these light up and are visually appealing. However, it’s important to keep in mind that at a very young age a child could view an iPad as a toy, which of course it isn’t. So, some experts have determined that it’s usually not a good idea for a child under the age of 3 to be allowed any iPad activity. From the age of 3 to 5 years of age, a child can start interaction under parental supervision for around an hour. By the age of 6 when they enter school, it might be time to consider giving them a cheaper iPad model or perhaps your previous iPad as you upgrade to a new one, along with a good sturdy iPad case designed for kids. From age 6 to 18, it is also important to make sure a child spends no more than two hours on a tablet computer. An iPad is great and can even benefit a child educationally but there is also real-world interaction with other kids, that is just as important. q: What if a parent does plan to give a kid their previous iPad, which already has a case, would this case be ideal for a child? Although, not a bad idea for a parent to hand down their previous iPad model to a child who is ready to have their own iPad, but the case could be another story entirely. An iPad case for kids has certain parameters that have been taken into consideration to take the wear and tear that can happen. 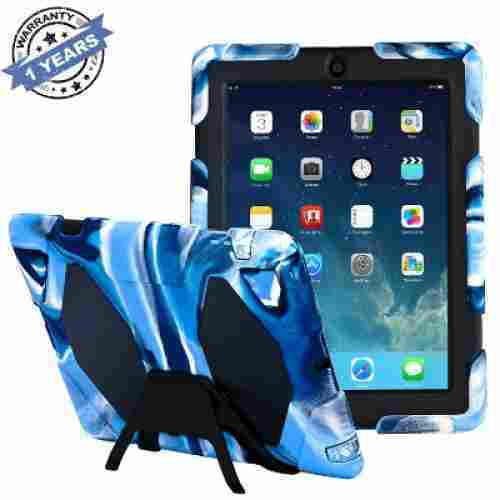 The iPad cases for kids come with certain features that will protect an iPad from things such as accidentally being dropped, having liquid spilled on them and other mishaps associated with a child. So, while it might be fine to pass on the Apple iPad, the case isn’t recommended. 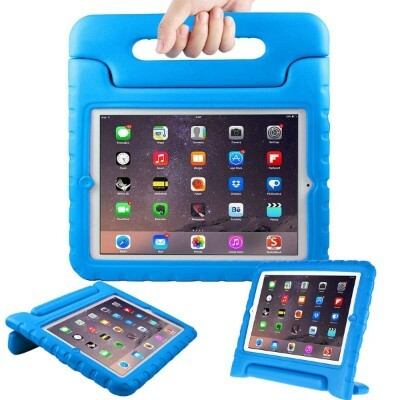 The best course of action, if your new iPad fits inside the old case, then keep the old iPad case for yours, and purchase a separate iPad case designed for kids to give your child your along with the old iPad. q: How do I know which iPad case will fit my child’s particular device? One thing to remember when buying an iPad case is that we want the tablet to fit securely within the case. This is the main reason that the case is being purchased. One way to ensure the right case is being bought is to know the model of the iPad your child has. Once the model is known, it’s also a good idea to know the measurements of the device in general, usually this will be mentioned by the manufacturer on the box and if this is an iPad that is being handed down, a search can always be done online to get the proper specifications. From there, look at the various iPad cases for sale and look at the measurements of parameters that fit around the tablet itself. A parent can decide which iPad case they feel is going to appeal to their child or even have the child help select it. There are several different kinds on the market including those that were stated above which include several features such as a free-standing feature, durability, fun designs and also pleasing colors that will no doubt delight a child. q: Do these cases properly support slots such as USB ports and on/off switch? This can be a tricky feature when it comes to iPad cases. Why? Because some of these cases are designed to be used with different series of iPads such as the iPad1 and iPad2 series. In some cases, due to the model, the slots that are provided on the cases may not line up as desired. The best course of action is to read other customer reviews online to see what others have said regarding this feature pertaining to the case you have in mind for your child. If there is an issue, odds are it will be discussed. q: Do all of the iPad cases for kids cover the screen as well? As stated above there are a few iPad cases for kids that do include a screen protector feature that we included on this list and there are some on the market as well. However, for the most part, iPad cases, even those design for kids, usually don’t cover the screen. So, in order to protect the iPad screen from things such as sticky hands or from being scratched, one method is to use a separate screen protector, which is like a transparent protective skin, that goes directly over the screen. However, these may not be necessary if a kid is taught the importance of caring for the iPad and if a kid is taught how to use a touch pen which can replace using a finger to navigate the screens on the iPad. q: Is the EVA foam used to make kids iPad cases really safe and nontoxic? At first, EVA foam was considered a safe alternative to the standard PVC plastic materials. However, recently, it was made known to the public that some forms of EVA foam did contain the chemical formamide which does have toxic properties and had been proven harmful. In order to put consumers’ minds at ease, manufacturers started to come up with ways to remove formamide from the EVA foam that was being used, especially in items designed for use by kids. This is indeed the case with the iPad cases listed above, which have been determined to be safe and nontoxic. If this is still a concern, usually a manufacturer will clearly state that if a product is made from EVA foam it will be noted as safe and nontoxic on the packaging, and in some cases actually state outright that the product is free of formamide.